Research shows Americans work more than anyone in the industrialized world. They also take less vacation, work longer days and retire later. Productivity and stress management trainer and coach, Joe Robinson, author of, “Work to Live” and “Don’t Miss Your Life,” says the issue is driven by a number of factors. Namely, work force cutbacks and lean staffing make it difficult for people doing the jobs to get away. People are also afraid to take vacations in the “layoff era” for fear they will appear less committed than coworkers. A number of studies have shown that taking time away from the job can have physical and psychological health benefits. People who take vacations have lower stress, less risk of heart disease, a better outlook on life, and more motivation to achieve goals. As a follow-up to last month’s blog on summer vacation we wanted to dive deeper into the practical side of vacation. We asked the same panel of 1,300 Baltimore area residents how they planned for vacation in terms of costs, online resources and other factors that assist them in getting the most out of their summer getaways. While most respondents report they are going on vacation this year, the length of time respondents indicated they will spend on those vacations shows a more practical and probably affordable side. 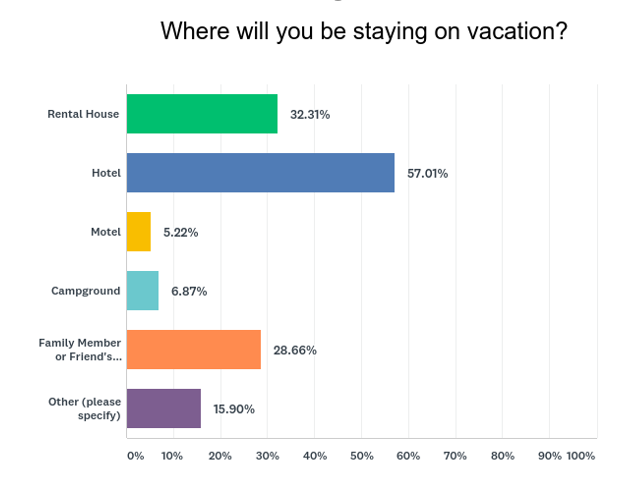 Only about (11%) said their typical vacation would be 2 weeks or more. 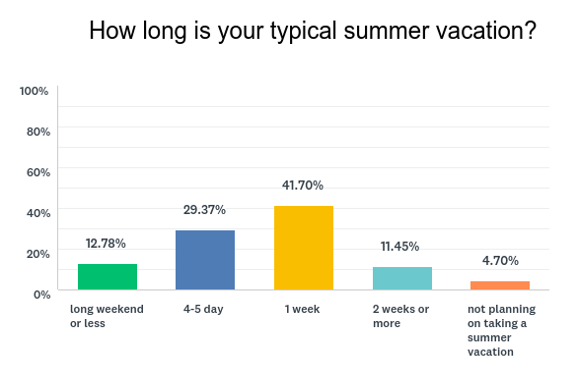 Eighty-nine percent (89%) of respondents indicated that their typical summer vacation would last a week or less or that they would not be taking a vacation. 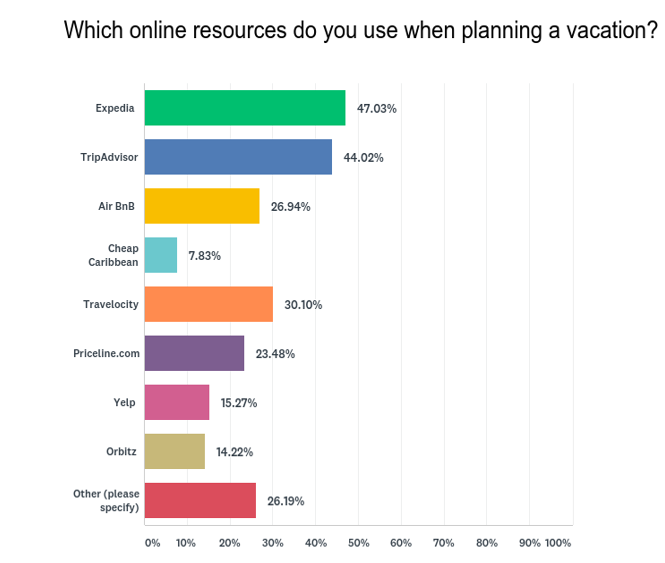 With families and individuals looking to make the most of their week off, we asked which websites they used when planning a vacation. Expedia and TripAdvisor were the most popular selections. Almost a third of people asked said they were planning on staying in a rental house while (57%) said they were staying in a hotel. More affordable lodging options such as motels and campgrounds were far less popular. 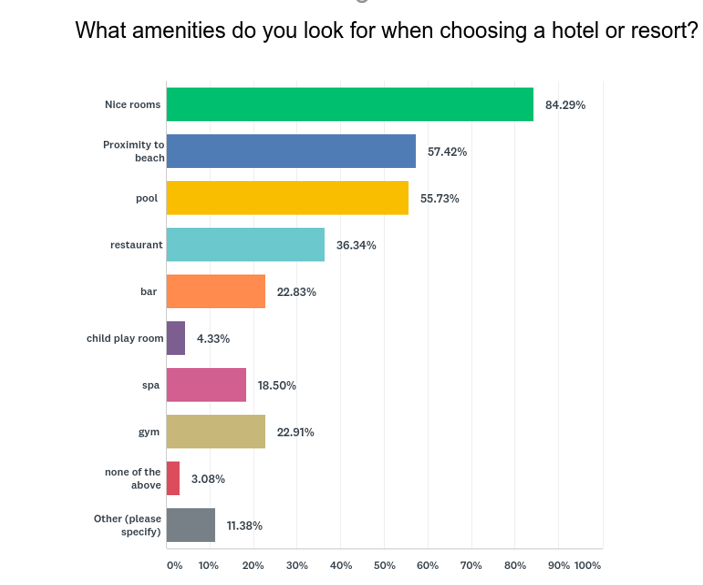 While proximity from accommodations to a beach or pool were important factors to over half of our respondents, having a nice room as a home base during their vacation was the most popular selection (84%). This entry was posted on Wednesday, June 6th, 2018 at 2:10 pm. Both comments and pings are currently closed.